We’ve been taking a look at TV toy ads to see how they show children’s play, and what picture they give viewers about boys and girls. The results are pretty depressing. It’s that wonderful time of the year, when the toy industry goes into overdrive trying to convince children which toys they desperately need Santa to drop down the chimney. But many of Santa’s surprises will have been produced and promoted in the belief that boys and girls should have different toys and should be targeted separately. ‘Tis the season for excessively stereotypical selling practices. If you think toys and toy ads are trivial, just ask a kid how much they matter. 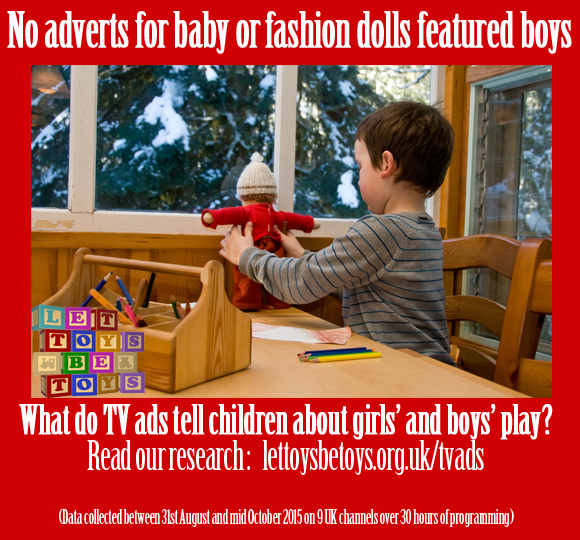 Research carried out by Let Toys Be Toys volunteers shows that toy ads reinforce limiting gender stereotypes, and sell children a narrow view of boys’ and girls’ play. Read more about our TV toy ads research. Girls on TV – who’s watching? Campaigner Jess Day looks at the links between toy marketing and children’s media, and why discussion of how girls are represented in media needs to talk about boys too.